The Monkey Forest known locally as DON CHAO POO is situated on the eastern edge of Ban Phana. The people of Phana believe that the original village was situated close by, possibly where the small satellite village of Muang Sawat is now. The forest, like many similar forests in this part of Isan, is the ‘home’ of the village’s guardian spirit, hence Don Chao Poo which translates roughly as ‘the place of the spirit grandfather’. The word ‘Chao’ can also mean Lord or Prince, so ‘Chao Poo’ suggests a very high level of respect and reverence. The guardian spirit of Phana is supposed to be the hunter who first led people to set up a village here so he is depicted in a statue dressed as a Lao hunter might have been. 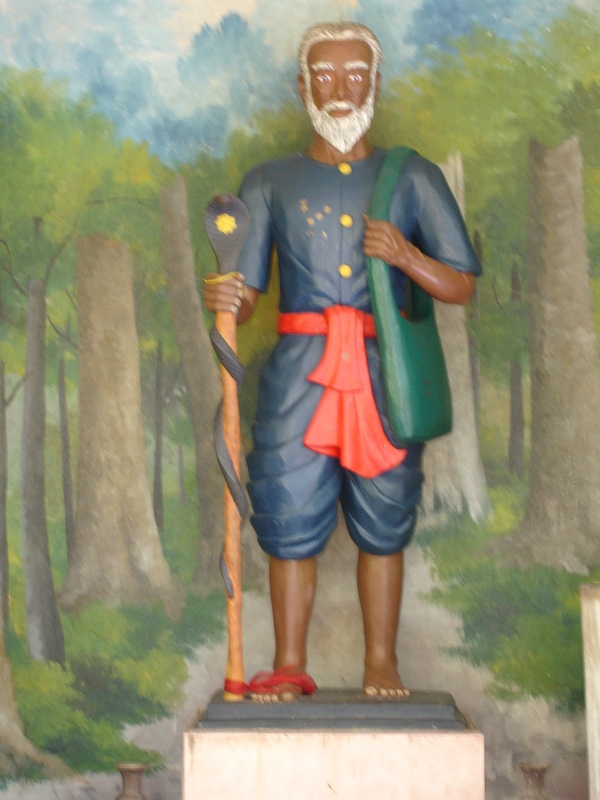 He is holding a stout wooden staff around which a cobra is entwined, and he carries a bag over one shoulder, as any self-respecting traveller would do. In fact this is a highly stylised depiction. A Lao hunter of the time would not have been dressed as smartly as this grandfather is and nor is he likely to have had a white beard. Guardian spirits can also be found in most temple compounds in this part of Thailand and invariably they are venerable old gentlemen with whit beards, and often with long white hair, too. They bear some resemblance to the real-life yogis that you can see in parts of India. This entry was posted in guardian spirit, Long-tailed Macaques, Macaca Fascicularis, Macaques, Monkeys, spirit cults and tagged Isaan, Isan, Long-tailed Macaques, Macaques, Thai guardian spirits, Thai monkeys, Thai primates, Thai spirit cults. Bookmark the permalink.